I confess I’m still exploring our new Whole Foods almost every day and I usually find a little something to take home. I’ve been explaking the concept of the store to strangers who are walking around drop-chinned and glassy-eyed at what is for many here a totally different food shopping experience. I need to find Manager Mark Heinz, formerly of El Paso’s Greenery, and ask for a job as a tour host. Yesterday, I had a craving for scallops. I rarely cook them at home because, the ones we usually find here are limp and milky and not something I want to spend good money on. When I looked at the scallops at Whole Foods, they were dry, firm and good-sized. I signed the papers for a second mortgage and invested in 10 lush scallops weighing in at just over a pound. The fishmonger told me their supplier ships them “dry-packed” instead of just in a box of ice. It makes a big difference! I browned the scallops in butter and minced garlic in two batches and set them aside. I then added a generous splash of white wine and juice of half a lemon and let it reduce for several minutes. I tossed cooked and drained fettuccine into the pan sauce to warm the pasta, then stirred in about 3/4 cup green peas. A little salt and pepper balanced it out. With the scallops, I served a romaine, baby spinach and small cucumber salad dressed with a wonderful creamy fennel dressing. The dressing had crushed fennel seed, sour cream, red wine vinegar and buttermilk. I would roll in the dressing if the bowl were big enough! Dessert was a simple bit if Vitorin and a hot soak in the spa on a chilly fall evening. Scallops browned in butter and minced garlic served atop fettuccine in a white wine pan sauce. A creamy fennel dressing on the salad compliments the scallops. This recipe makes about two cups. (About 12 servings) It can be halved easily. Whisk together mayonnaise, sour cream, buttermilk, parsley, vinegar, garlic Italian seasoning and fennel seed; season with salt and pepper. Cover dressing and chill at least two hours before serving. Toss greens, sliced snacking cumbers and croutons, drizzle with dressing. I used romaine and baby spinach greens. No real recipe. Melt butter in a wide pan, stir in garlic. Pan sear the scallops in butter and minced garlic, turning once after about five minutes until both side are browned and scallops are opaque. Remove to a plate. Add a good cup of dry white wine and the juice of half a lemon to pan juices, stir loose any fond and reduce liquid to about half a cup. Stir in cooked fettuccine to warm. Add about a half a cup (or more to taste) green peas and warm. 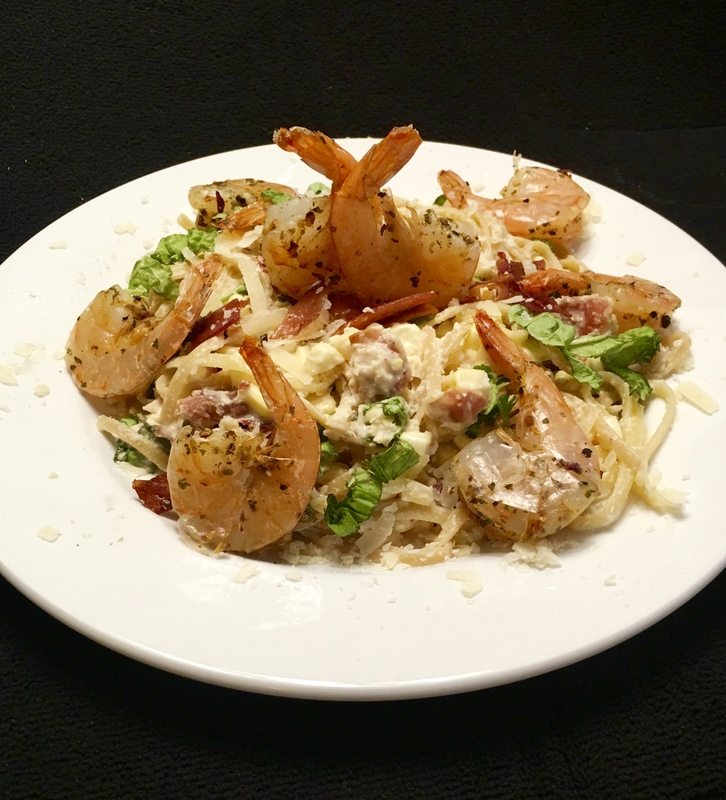 Plate fettuccine, top with scallops and drizzle with any liquid left in pan. I used five plump scallops per serving. 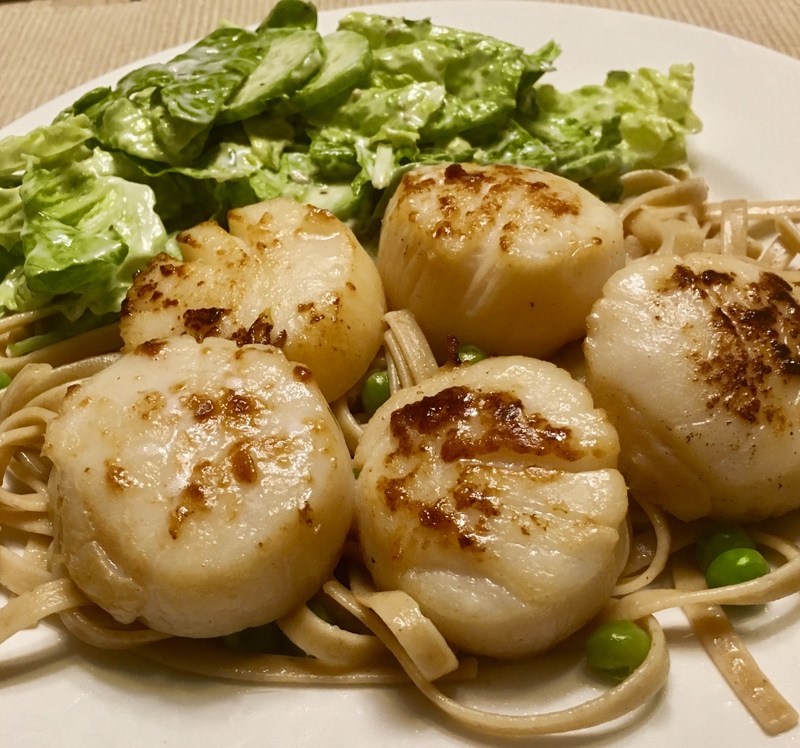 I could have gotten away with three per serving with more pasta, but I was after scallops! It’s an amazing world. We can get “seasonal” treats including strawberries, melon and asparagus almost year ’round. Spring vegetables are not quite the same when shipped from another hemisphere, but they are in the markets. We’re beginning to get nice fresh asparagus in and I couldn’t be happier. I saw a recipe on a magazine cover for a bucatini, pesto, asparagus and shrimp dish that got me all excited. My basil is only about two inches high right now, so I cheated and used jarred pesto and it worked fine. I did throw in a handful of green peas just to make things a bit more springy. It only took shopping three stores to find bucatini! When it all came together it was worth the shopping hunt. 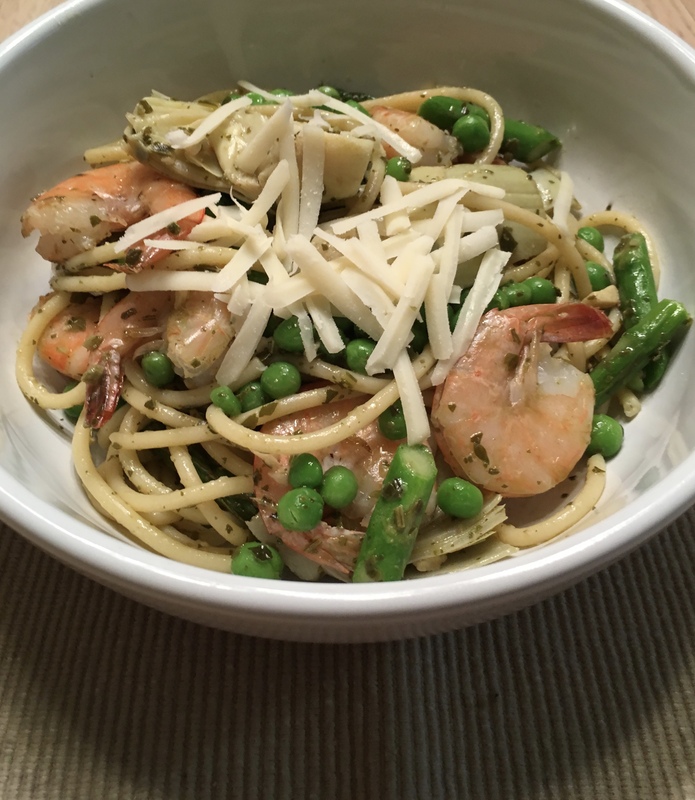 Bucatini, pesto, asparagus, peas, shrimp and parmesan tastes like spring! Boil bucatini in salted water per package directions. I like it al dente. When pasta is done, set aside a cup of pasta water, drain the pasta and place in large bowl. Cook shrimp in a dry pan over medium heat until it turns pink and curls. Turn and toss until both sides are pink. I like shell on shrimp and don’t mind peeling it at the table. If you are tidier than I, use already peeled shrimp. Set shrimp aside in a large bowl, wipe out the shrimp pan. Snap off though ends of asparagus and cut tender part into short segments. Melt butter over medium heat in the clean shrimp pan and sauté asparagus until tender and bright green. Don’t over cook. Add peas and warm them just a little. You want them to be bright green and have some texture. Remove from heat an place in a bowl to stop cooking. Grate about 1/2 cup of parmesan. Toss the bucatini with about 3/4 of the pesto. If it seems dry, add a couple of tablespoons of reserved pasta water to moisten. Don’t add too much water and make your dish soggy. Toss shrimp, asparagus and peas with remaining pesto and add to bucatini. Gently toss it all together. Check seasoning and add a little salt, if needed. Plate or serve in pasta bowls and sprinkle liberally with grated parmesan. This dish is good at room temperature or cold. Marialella, my Master Gardener friend, is into micro greens. She grows flats of sprouted herbs and harvests then when they are just an inch or two high and have their first two to four real leaves. They have amazing flavor and texture. Marianella has invited me to cook something for a school tour (80 third graders plus teachers and a few parents) at the teaching garden she manages for the Master Gardeners. 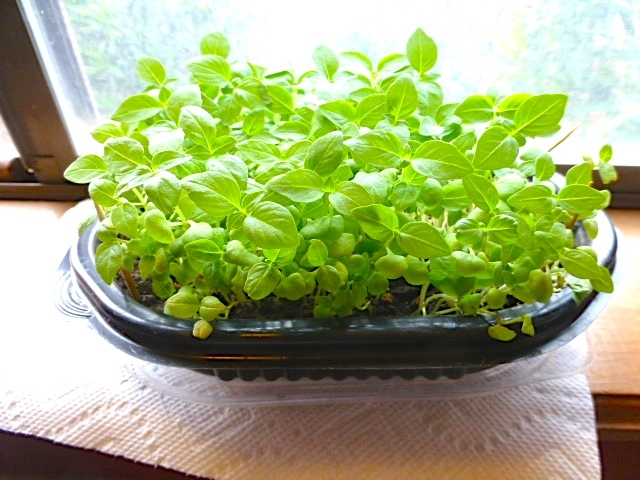 She gave me a tray of lemon basil microgreens and said, “I know you’ll come up with something good.” No pressure, right? I’ve enjoyed experimenting with the microgreens and have come up with an idea for the activity. I’ll share that on May 5, after the program. Lemon basil microgreens on the kitchen windowsill. In the meantime, here’s another idea I came up with and enjoyed very much. On the plate from the top: grilled romaine leaves topped with tomatoes stuffed with homemade ricotta and minced lemon basil microgreens with mixed olives for garnish; center stage is a sicilian sausage on a ratatouille of grilled eggplant, tomatoes, onion and red bell pepper tossed with a little balsamic vinegar and a splash of jarred marinara sauce. In the foreground, a foundation of farfalle (bow tie) pasta and parmesan peek out from under the ratatouille. A few seconds on the grill wilts the romaine lettuce and gives it a slight char flavor. It is a quick process because you don’t want to burn the lettuce to the crumbling point. It’s a nice touch for the occasional salad. Co-chef Sarah Rich of Rich Table fame in San Francisco has a recipe for homemade ricotta in the May issue Bon Apetit. It is simple to make and so very much better than the grainy ricotta from the store. Sarah is the daughter of my good friends Darryl and Susan Williams. I am so enjoying the success she and husband Evan Rich are having with their restaurant and the reputation they are gaining in the culinary world. 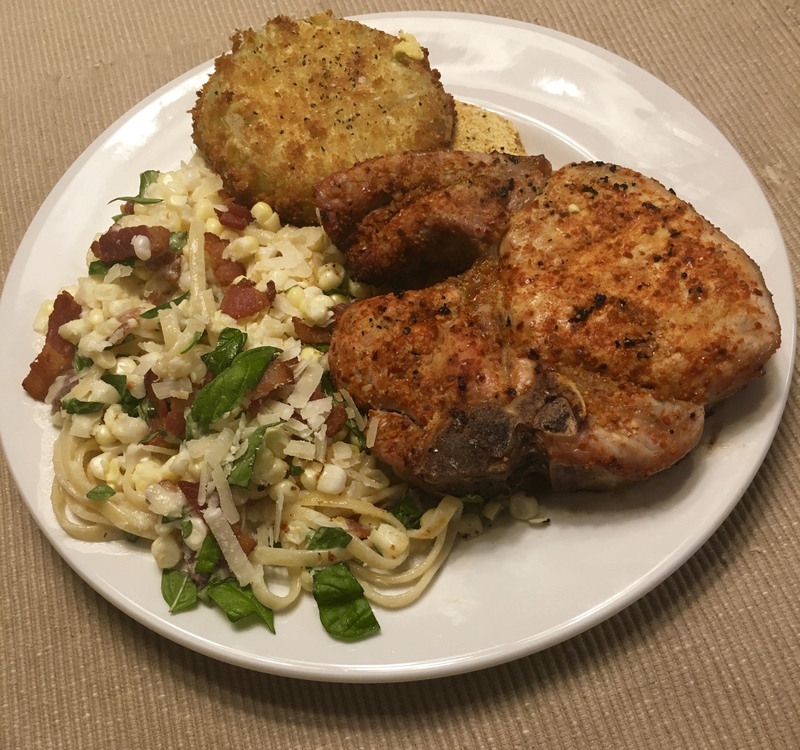 I really love it when one of their recipes gets published and I get to try my hand at it. This ricotta is a keeper I’ll make again and again. I developed this idea much earlier in the year. After all these months, it is still good! 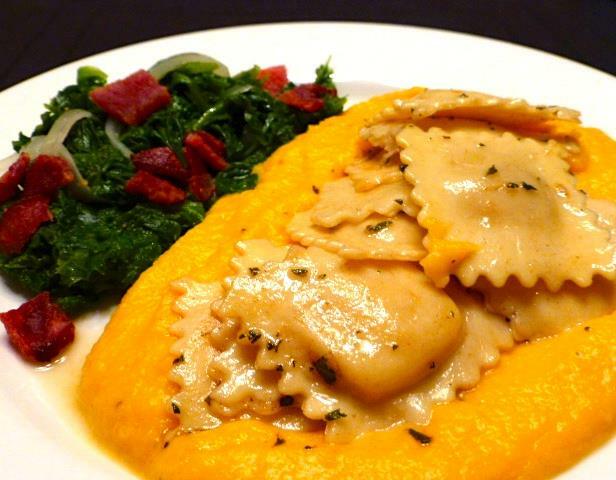 Puree of butternut squash and chicken broth topped by four-cheese ravioli cooked and then tossed with brown butter and fresh sage. In the background, steamed mustard greens and onions with a bacon dripping and vinegar dressing topped with crisp chopped bacon. Sweet, savory, tart, bitter and salty. All the flavors complement and balance each other. 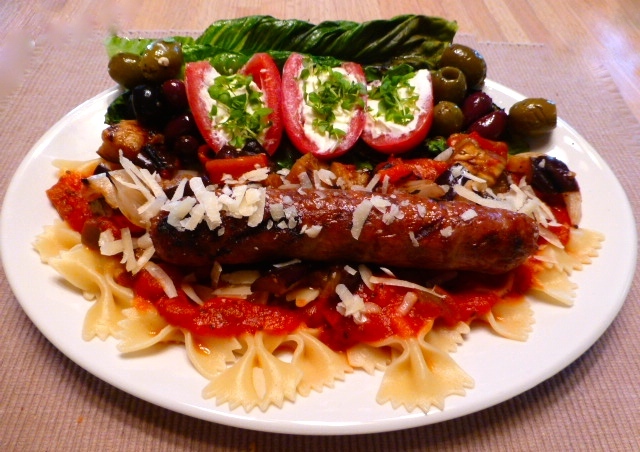 A link of Sicilian sausage. Whole grain linguini. While the pasta boils, brown your sausages and cook until done. Set the sausages aside. Add halved grape tomatoes to the pan and sauté until they release their juices. Nest, sweat sliced cremini mushrooms in the tomato juices. Add thinly sliced red and yellow bell pepper and a splash of pasta water and simmer until pepper slices are tender. Add some Newman’s Own fire roasted tomato and garlic pasta sauce (yes, it is a jarred sauce that I like to use as a base) and a very small splash of pasta water. Stir and reduce until reasonably thick. Plate pasta, top with thickened sauce. 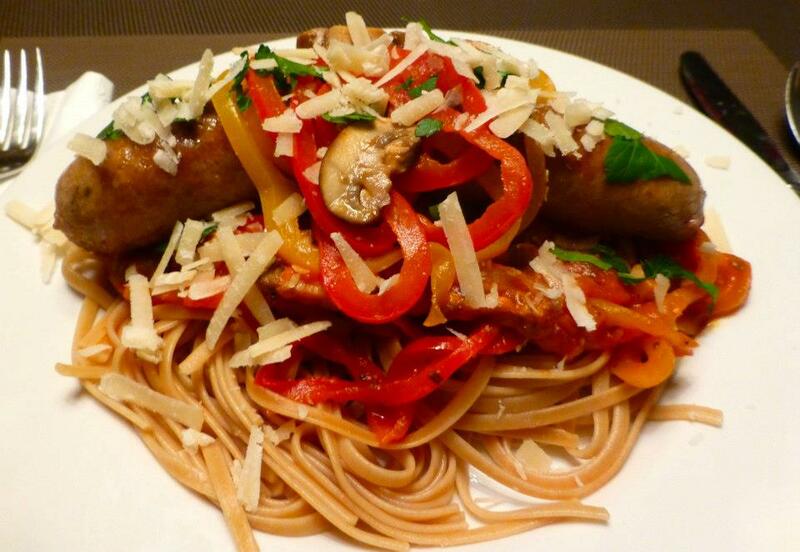 Add sausage and garnish with peppers, mushrooms, freshly grated parmesan and parsley. The pasta is whole grain linguine – a staple in my kitchen. If you are feeling adventurous, add a whole wheat bollio roll sliced, buttered, seasons and heated for an individual loaf of garlic bread.